2007 Perl Advent Calendar: On the ... which day again?!? On the ... which day again?!? Many things have a schedule of events or calendar of some kind. iCal (RFC 2445) is the standard for people to share calendars with one another, and Data::ICal provides perl with ability to both parse and generate calendar files. Have event information or dates stored in a database or just listed in a file? Export them out into an iCalendar .ics file to be read by your favorite calendaring application: Sunbird, Google Calendar, Outlook, etc. 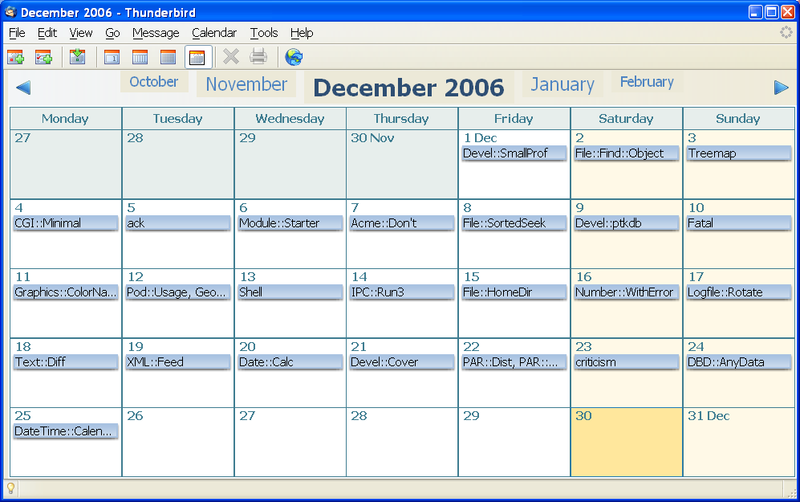 The resulting file is perladvent.ics which can be loaded as a remote calendar in your favorite application, as in these screenshots of Thunderbird and Google Calendar. Now you can "open the window" (on the calendar) each day by regenerating this year's (or really any year 2000-2007) events with a combination of the scraper and Data::ICal scripts mentioned above [mod1c.pl], or perhaps more sanely add some daily reminders generated by reminders.pl. This allows the full leveraging of established calendaring applications for maintaining calendars, reducing much wheel-reinvention, leaving more time for milk & cookies. This script generates twelve.ics, shown in the Google Calendar screenshot above. This script generates perladvent.ics from an AoH data file. 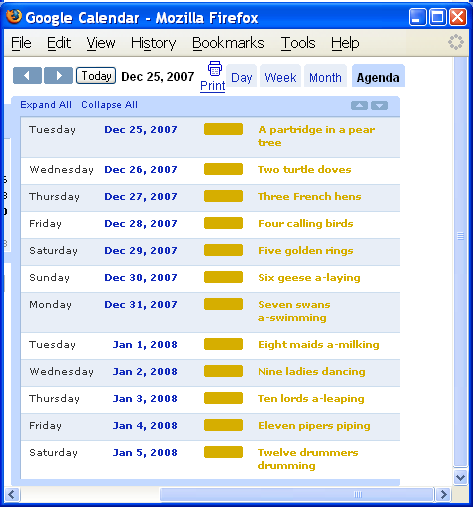 This script generates a calendar for a specific year from the Perl Advent Calendar archives. This script generates perladvent.html from an ICal file.